Usually, the spark that makes a television series or movie compelling and memorable is great plotting or vivid characterization. Sometimes, though, the popularity of a work is helped by what the characters are wearing or, more specifically, how they are wearing their hair. Star Wars is great, but think about how many people over the years have attempted to wind their hair around their head in attempts to recreate some of the most iconic sci-fi styles of all time. 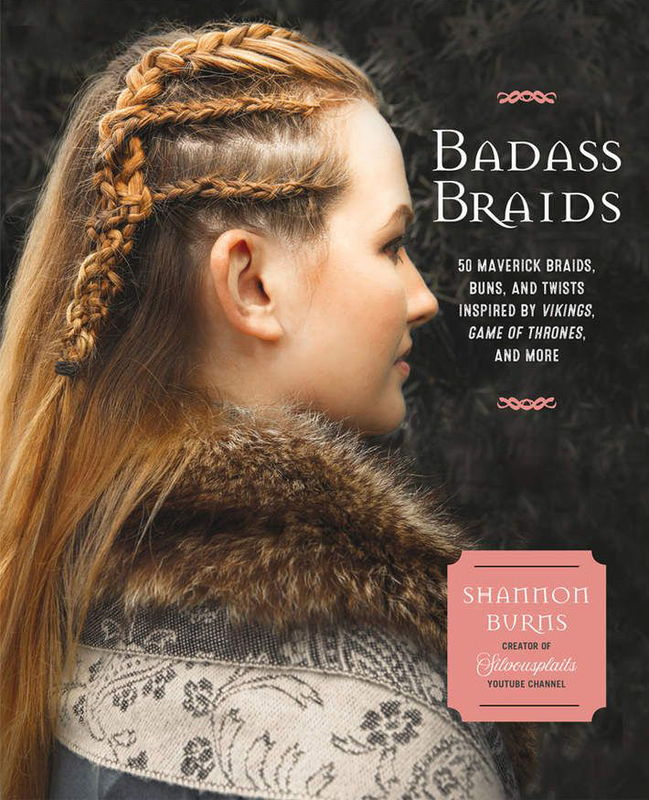 This is where Badass Braids: 45 Maverick Braids, Buns, and Twists Inspired by Vikings, Game of Thrones, and More by Shannon Burns comes in handy. By day, the author is a social neuroscience PhD student, but she also runs the Silvousplaits YouTube channel, which focuses on hair tutorials inspired by sci-fi, fantasy, and historical fiction shows and movies. Like the channel, Badass Braids provides step-by-step instruction for recreating hairstyles, but in a slightly different format. Animated Adventures (including Zelda of The Legend of Zelda: Twilight Princess). While the author covers a number of the same characters on her YouTube channel, it is worth noting that the book does offer some advantages for the do-it-yourself hairstylist. Compared to a video that shows only one perspective of someone doing their own hair, Badass Braids offers illustrated steps for each style, with the illustration showing the relevant side of the head. The simple illustration style easily indicates which bit of hair is going which direction, which can be helpful. Additionally, a book can be placed flat out in front of you and requires no fast-forwarding or constant screen activation to allow you to proceed to the next step or stop the screen from timing out. Each hairstyle includes a bit of information on its context, telling such things as who the person is who wore it, what their story is, why their hairstyle may be relevant, or tidbits about the story. Hair tips relevant to a specific hairstyle, such as possible variations for shorter hair or how to make the hairstyle look better, are scattered throughout. The book also has various behind-the-scenes information, providing even more details about possible inspirations or bits of trivia about the source material for a specific character. Thus far, I’ve tried two of the hairstyles on my daughter. The first one we did, inspired by Sailor Moon’s Usagi Tsukino (below), was the one she was most excited about after I let her flip through the book. 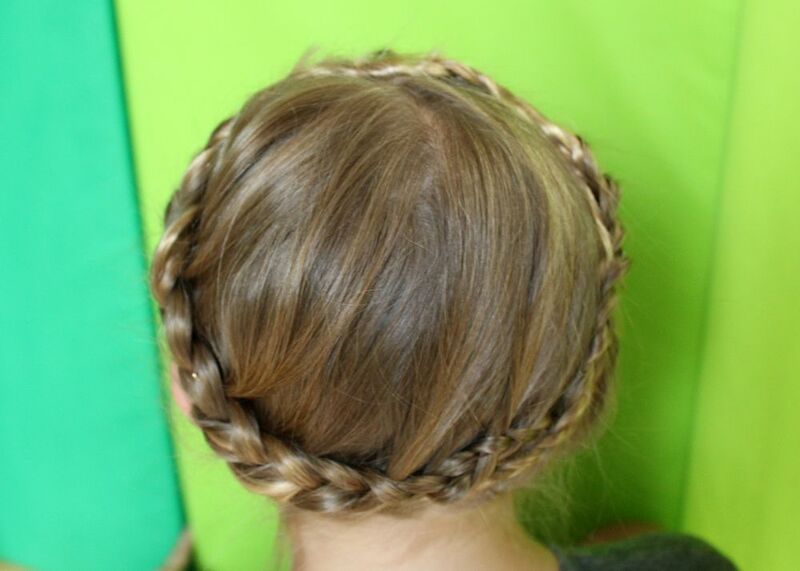 It’s one of the fastest, easiest hairstyles in the book, with a skill level rating of “easy” and an estimated completion time of 5 minutes. It worked well enough, and my only struggles came from issues unrelated to the book (adult-sized bobby pins being too big for a child’s head). We also tried an “intermediate” style: Leia Organa, inspired by Star Wars: The Empire Strikes Back. It was the first time I’d ever tried a Dutch lace braid (where you’re braiding “inside out” and only adding new strands of hair from one side of the braid), but we managed to make it through the hairstyle with only one restart. The instructions were easy enough to follow; our issues came from the fineness of my daughter’s hair and the wiggliness that comes from braiding on an almost seven-year-old. I only have two small complaints about the book. First, I wish the styles listed “hair requirements.” Each one indicates skill level (easy, intermediate, or advanced), approximate time, and materials needed to create the style, but it doesn’t say up front what would be the best—or even minimum—hair thickness or length for that style. While the book does discuss the use of hair extensions as a way to make things work better with thin, fine, and/or shorter hair, only a few styles indicate where in the steps those should be integrated. I do realize that the uniqueness of heads of hair would make exact universal guides difficult, but having a little better roadmap to cut down on trial and error would be nice. The author’s YouTube channel videos do have minimum hair length listed, so the omission of the information in the book seems strange. Second, a fourth rating option on the difficulty scale would have been nice; the “easy” rating seemed to cover a pretty wide range of skill. For example, both Usagi Tsukino and Mary, Queen of Scots, are listed as “easy.” This is accurate in that they are both significantly easier than any of the “intermediate” styles, but Usagi only involves making two ponytails and two buns, while Mary requires a braid wrapped into a bun and two lace braids that are wrapped around the bun. The gap in difficulty level between the two is pretty wide, especially if you’re new to braiding. For someone who is fairly new to hair styling, a better indication of which is good for a flat-out beginner would be less frustrating. In all, I think this book is a worthy addition to the information arsenal of anyone who enjoys cosplaying, playing around with hair, or intricate braids. The wide range of subjects covered makes it very versatile for a large number of costumes or special occasions. I have a feeling I’ll be creating more styles from the book in my daughter’s hair in the near future—and, once I get more practiced in French braiding on myself, mine as well. This is a book I probably need. I’m terrible when it comes to styling hair, so I’m not sure how this will go for me. Hopefully it’s easy to follow!